In this solo cooking adventure, Kate makes a great dessert in celebration of Mother’s Day. I actually got to celebrate Mother’s Day with a mother this year. Not my own mother who sadly lives far away, but BF’s, who also lives far away, but closer than my mom. We happened to be visiting his hometown (my first visit and first significant chunk of time with his ‘rents) that weekend. Naturally we were going to celebrate it. Naturally we would have a meal. Naturally I volunteered to plan everything. There were a few times during our menu planning where BF and I scratched our heads. How would we solve this culinary challenge? However as perplexed as I was at some points, I never was truly frightened in a way that made my armpits damp. Yes it was Mother’s Day dinner and my first time cooking for BF’s parents during my first visit to their home. I was even cool and collected when it was the Saturday before Mother’s Day and we had not yet decided on a main course. Why was I so calm? I had a trick up my sleeve that I knew would make everybody happy. That trick was a dessert that everybody likes. 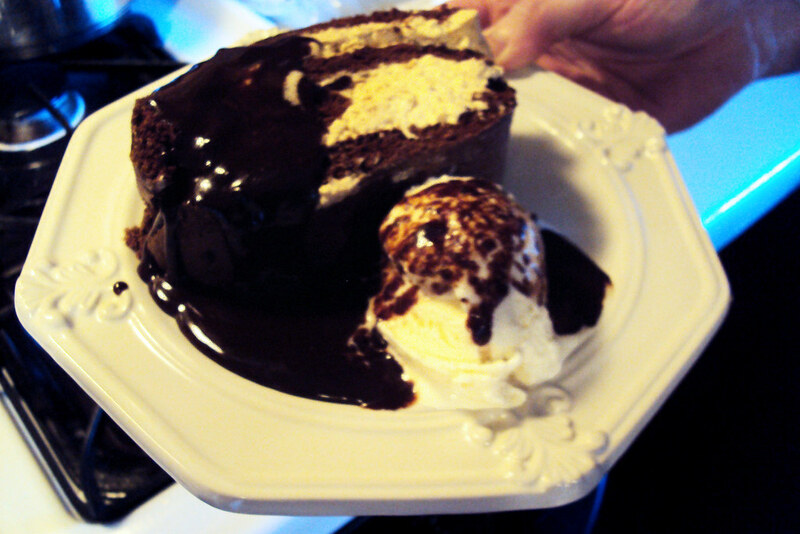 My grandma’s Chocolate Roll Cake. BF’s mom had made dessert the easy part on me. When BF was gathering food preference information prior to our trip, he had mentioned his mom likes chocolate. “Anything chocolate?” I asked, waiting for the catch (only dark chocolate, nothing with nuts, etc). “Anything chocolate.” He assured me. “Chocolate and peanut butter are also good, chocolate and caramel. . . .” I breathed a sigh of relief, understanding two things: 1, BF’s mom and I would get along just fine, and 2, even if the meal was a total disaster, at least she would leave the table satisfied with dessert. In my opinion, and particularly in the case of special occasion meals, dessert is the most important part. From one chocoholic to another, I knew what to do. 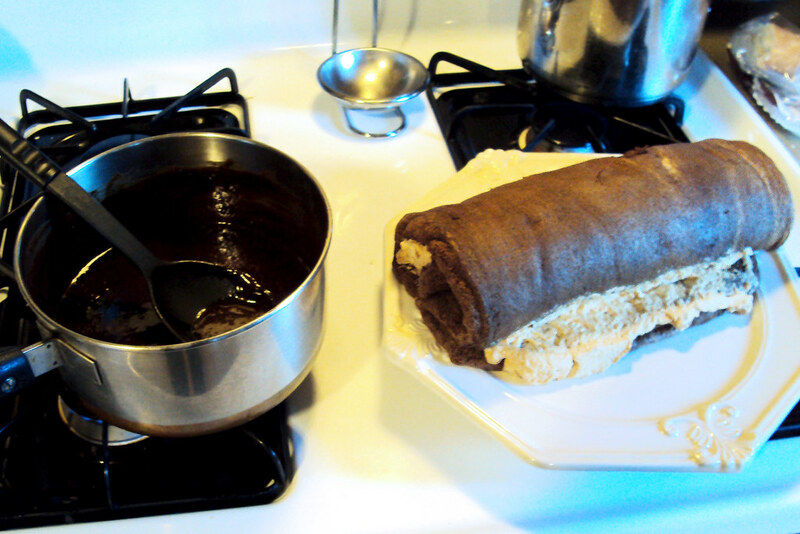 It was time to attempt something I’ve eaten dozens of times, but never made myself: My grandma’s Chocolate Roll Cake. I grew up with my mom making this cake, and she got the recipe from her mom. We would often have it on special occasions when I was little, so it reminds me of the eighties and early nineties. There was always a little chocolate sauce (a crucial component of the cake, as essential as the cake itself) leftover after dinner parties, and I would sneak to the fridge the next day where it was covered with plastic wrap in a little mug, and eat it by the hardened spoonful. (I say this with no shame as when you make this yourself, you will understand.) The cake disappeared from our lives however sometime around my high school years. My mom was making dessert less in general and when she did would want to try new things. I had forgotten all about this cake until a few months ago. My mom was preparing a small dinner party for a Very Important Couple. The husband was a big client of my dad’s, and my dad also really liked him personally. Now, my mom has made dinner for many a client. She’s planned and cooked dinner for friends, for priests, her children’s teachers, extended family, co-workers, her daughter’s boyfriends, her boss, even a current member of the Supreme Court (seriously), yet I’ve never heard her stress a dinner party like this one. It had to be perfect. Because my dad, rather than sitting back like he normally does, and staying out of the details, actually cared about impressing this couple, and he had made it known. And my mom could not let him down. (I think she was titillated by a novel challenge, hmmm, perhaps like her daughter on Mother’s Day . . .). She painstakingly planned a menu. Very cutting edge and seasonal and gourmet. She ran it by my dad. He wrinkled his nose. And so he did. For the first time in their 30 years of marriage, my mom gave over control and my dad planned dinner (she would still cook it of course, they’re not insane). When I heard what he picked, I understood what he wanted. Foods that, if not on the cutting edge of the foodie scene, were still elegant and more importantly, tasted good (think Wolfgang Puck’s spinach salad with blue cheese, apples and pecans, another pleaser from dinner party’s past. It’s not exactly innovative, but totally delicious). Guess what my dad had chosen for dessert? Grandma’s Chocolate Roll Cake. After all these years. He had remembered. The day after the big dinner party I couldn’t wait to hear how the whole thing went over. “Fantastic.” my mom said. At my request she debriefed me on each moment of the night, from what the wife was wearing (flats and a darling short dress with a high neck), to appetizers, to salad to the main course (raves all around) and when she got to dessert she recounted this detail with disbelief: Apparently, the Very Important Man put his fork down after a few bites. My parents looked at each other. I imagine my dad grinned and my mom imperceptibly squinted and shook her head at him. Everyone cleaned their plates. When the Very Important Couple left, my parents put their feet up in exhaustion and relief and did something unprecedented. As they replayed every detail and impression of the successful evening, they polished off the rest of the Chocolate Roll cake. Just the two of them. Mother’s Day Dinner with BF’s parents turned out to be a success too despite the odds stacked against us. I made a delicious salad that won raves (recipe later). BF stepped up and made an excellent version of Cacio e Pepe (turns out Dad doesn’t hate pasta after all and they were in fact expecting it), and I of course made the Chocolate Roll Cake. Unfortunately it didn’t look anything near as pretty as my mom’s perfectly symmetrical spiral beauty of cake with the bright whipped cream that I remembered. It was more of a lopsided log, but it tasted the same and I covered it in the rich chocolate sauce that makes the dessert really pop. BF had the idea to add ice cream to it and I acquiesced. After all, it was a very special holiday. And unless they’re very talented actors, both parents appeared very happy. I felt like both my mom and my grandma were there with us in spirit. I think that on Mother’s Day, as on any other Very Important Day, this cake is exactly what you want to eat. Line a 15-½ x 10-½ x 1 inch jelly roll pan with aluminum foil; generously grease foil. Beat egg yolks 3 min on med. speed. Gradually add ½ cup sugar; continue beating two minutes. Combine flour, cocoa, ¼ cup sugar, baking soda and salt; add alternately with water on low speed just until batter is smooth. Add vanilla. Set aside. Beat egg whites until foamy; add 1 tablespoon sugar and beat until stiff peaks form. 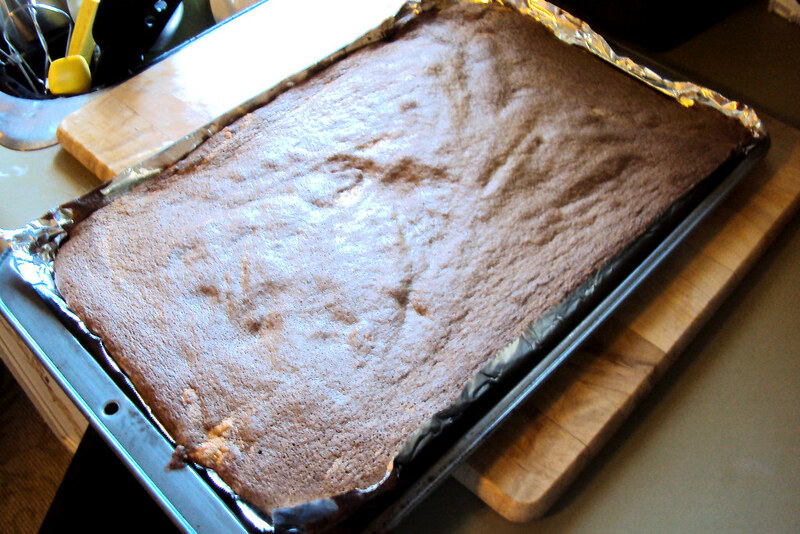 Carefully fold into chocolate mixture. Spread batter into prepared pan evenly. Bake at 375 degrees for 14-16 minutes or until top springs back when touched lightly. Remove from oven and invert onto slightly dampened towel; carefully remove foil. 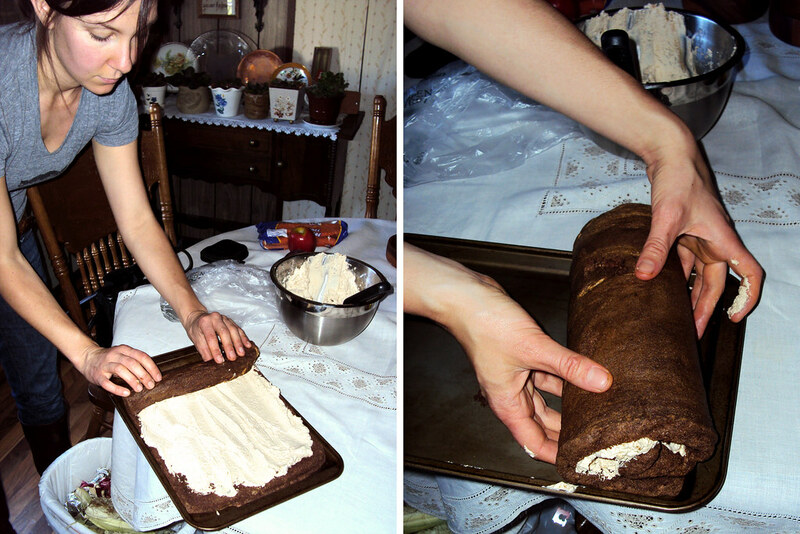 Immediately roll cake and towel together from narrow end. Let stand one minute. Unroll; reroll omitting towel. Cool completely on wire rack. Unroll cake and spread with whipped cream flavored with 1 tablespoon instant coffee granules and 1-2 tablespoons confectioner’s sugar. Prepare sauce and serve warm. Combine cocoa and sugar in saucepan; blend in evaporated milk and corn syrup. Cook over medium heat, stirring constantly, until mixture boils; boil and stir one minute.